If you are looking for tourist information about Padua / Padova, please visit the website of the local tourist office. 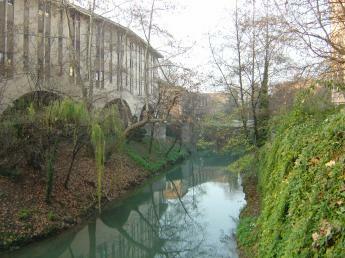 The city of Padua (Lat. Patavium, It. Padova) is the economic and communications hub of the Veneto region in northern Italy. The capital of Padova province, it stands on the Bacchiglione River, 40km west of Venice and 29km southeast of Vicenza, with a population of 211,985 (2004). The city is included, with Venice (Italian Venezia), in the Padua-Venice Metropolitan Area, population 1,600,000. Its agricultural setting is the Pianura Padovana, the "Paduan plain," edged by the Euganaean Hills praised by Lucan and Martial, Petrarch and Ugo Foscolo. The city is picturesque, with a dense network of arcaded streets opening into large communal piazze, and many bridges crossing the various branches of the Bacchiglione, which once surrounded the ancient walls like a moat.